This signed-and-numbered print is from John Ruthven ’43. Mr Ruthven is best known for his detailed paintings of wildlife. He was awarded the National Medal of Arts in 2004. 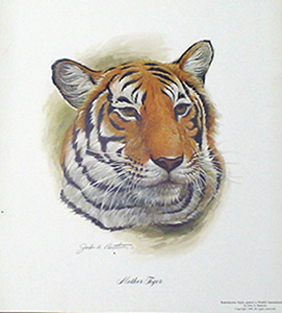 Being a Withrow grad, Mr. Ruthven has named this print “Mother Tiger”. The print measures 12 inches wide by 13 inches tall. The original of this painting hangs in the lobby at Withrow today. Be among the few who own a collectible painting by one of Withrow’s most recognized artists! This lovely painting reminds us all of the special beauty of the Withrow campus on snowy days. It is a gift from the architects who completed the major renovation of Withrow recently. The print is a watercolor and is suitable for framing. It measures 14 inches wide by 11 inches tall. 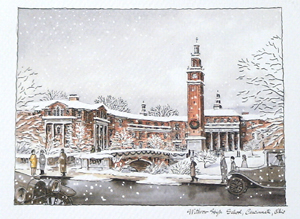 Put a reminder of Withrow’s wintry beauty on display on your wall!